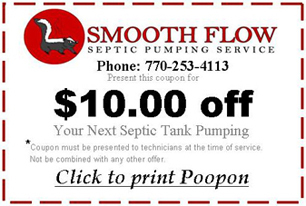 Welcome to Smooth Flow Septic we were established in 2005. We started just as a pumping service and have grown to offer services such: drainfield repair and installation, pump repair and replacement, wastewater testing, tank replacements and on-site inspection. We can take care of all you septic needs. Smooth Flow is a family owned and operated. We are licensed and insured providing service to residential and commercial customers. Our service area is Coweta County, being located within the county gives us the ability to provide fast, reliable and quality service to our customers. Call us today for septic tips, pricing, scheduling and information regarding the care of your system.